We’ve been severly neglecting readers of szarp.org over last serveral months and we’re very sorry about that. To compensate for this, we decided to give you, our beloved readers, a little visual seak peek at what we’ve been up to recently. So, lo and behold – draw3 and sz4 engine in action! What you can see on the picture is good ol’ draw3 hooked to brand new, almost completed sz4 database engine. What’s all the fuss about, you may ask, after all it’s just draw3 drawing some graph. And yes, this is indeed true. 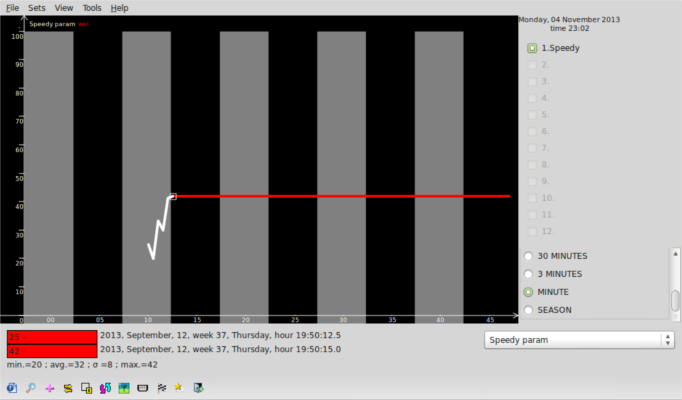 However if you take a closer look you may notice one novel thing – the time resolution of the graph being displayed. New database engine is able to store data with subsecond time resolution and now draw3 is capable of (at least partially for now) taking adantage of this fact. Theoretically new database format lets us store data with up to 1ns precision, however other factors are limiting this value somewhat – e.g. draw3 due to usage of wxWidgtes date and time classes is only able to draw trends with up to 1 ms resolution, but if the need arises we could go definitely go lower than that. So, when it’s going to be production ready – I hear you asking. Soon, we hope. There are still some bits and pieces missing and we’re also have some bugs to squash. So, stay tuned!